The Navy's unmanned yellow submarine is about to sail — but no one lives there. 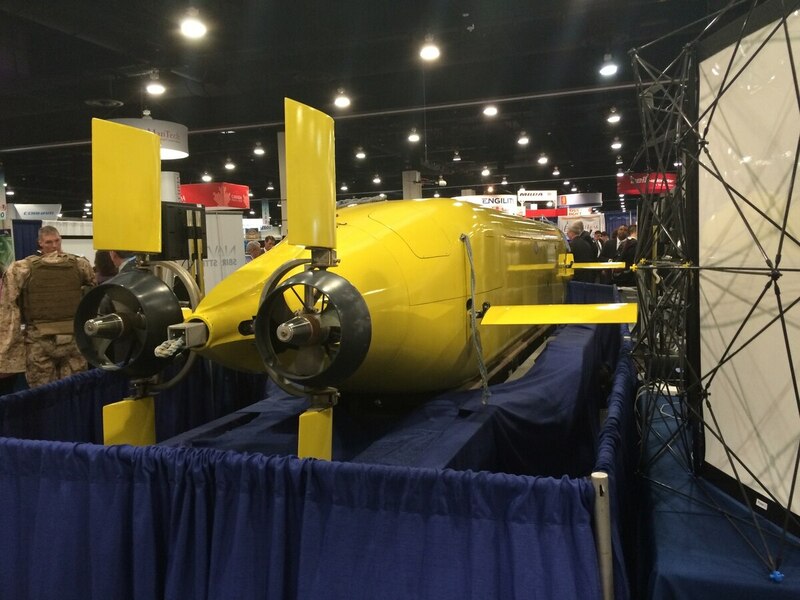 The Large Displacement Unmanned Underwater Vehicle, an experimental sub built by the Office of Naval Research, is set for a sea voyage in 2016 from put its long-range underwater drone on display at the 2015 Sea-Air-Space Convention as it gears up for a demonstration in 2016 that will bring it from San Francisco to San Diego. The drone sub Large Displacement Unmanned Underwater Vehicle is ONR's attempt to crack a persistent problem in the development of underwater drones: the ability to operate autonomously underwater for a long time, using its sensors, while navigating safely. The head of ONR, Rear Adm. Mat Winter, told a crowd on the exhibition floor at the Sea-Air-Space Expo that the drone, which the Navy will start acquiring this yearwill start being acquired this year, can already operate for up to 30 days, but the goals are much loftier. "I'm talking power generation, fuel and battery technology, that can approach months and years of underwater domain activity," Winter said. But that's something that the Navy is still figuring out. The test platform on display at Sea-Air-Space is being run on a number of types of fuel cells and power generation constructs as they work up extending the underwater time, he said. Winter said getting the LDUUV's longevity up — along with keeping it from bumping into underwater obstacles, from submerged mountains to fishing nets — are the goals for the program, which is going into the acquisition phase this year. "We're doing various [test] runs to understand the best configuration, best chemical reaction configuration, and fuel cell technology ... being led by ONR scientists are really makings some groundbreaking headway on that." Those capabilities will be put to a big test next summer, Winter said. The LDUUV is slated to make an autonomous transit from the San Francisco area to San Diego next year. The Navy has a grandiose vision for the LDUUV. According to recent requirements documents posted on the federal contracting database FedBizOps, the Navy ultimately wants to use the LDUUV for a range of missions from underwater reconnaissance and mine countermeasures to launching aerial drones for surface reconnaissance. The LDUUV is being designed to launch from a Virginia-class submarine's torpedo tube, a littoral combat ship or a dry dock shelter, according to the requirements. The LDUUV would help backfill demands from combatant commanders for attack submarine intelligence, surveillance and reconnaissance missions, said a retired submarine captain and UUV expert who spoke on background. "When [Adm. Gary] Roughead was CNO he tasked ONR with creating a UUV that could do 'real misions,' " the source said. "An SSN can go out for 45 to 60 days at a time, so that's what ONR is trying to do." The source said the Navy needs to have realistic expectations of what these drones can accomplish, given the complexities of navigating underwater autonomously, the severe limitation on data transmission between the sub and its controllers while submerged, and the difficulty of creating enough power from either fuel cells or batteries to keep the sub operating over long periods of time. One option the Navy is exploring, the source said, is creating a network of underwater data transmission stations, like telephone booths, that the sub could navigate to and upload data from its sensors at a high data transmission rate. But all of that comes later, the source said, because right now the focus is just getting LDUUV to operate without bumping into things. "Right now they are trying to just build the truck," the source said. "What they load onto it, that comes later."